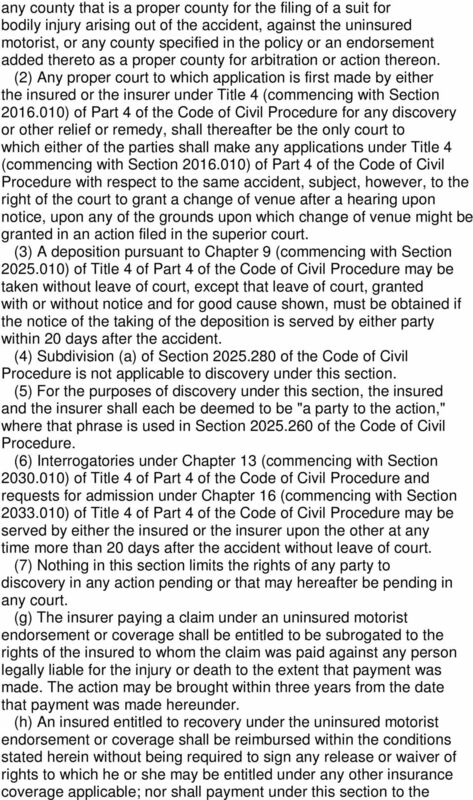 Download "Insurance Code section 11580.2"
1 Insurance Code section (a) (1) No policy of bodily injury liability insurance covering liability arising out of the ownership, maintenance, or use of any motor vehicle, except for policies that provide insurance in the Republic of Mexico issued or delivered in this state by nonadmitted Mexican insurers, shall be issued or delivered in this state to the owner or operator of a motor vehicle, or shall be issued or delivered by any insurer licensed in this state upon any motor vehicle then principally used or principally garaged in this state, unless the policy contains, or has added to it by endorsement, a provision with coverage limits at least equal to the limits specified in subdivision (m) and in no case less than the financial responsibility requirements specified in Section of the Vehicle Code insuring the insured, the insured's heirs or legal representative for all sums within the limits that he, she, or they, as the case may be, shall be legally entitled to recover as damages for bodily injury or wrongful death from the owner or operator of an uninsured motor vehicle. 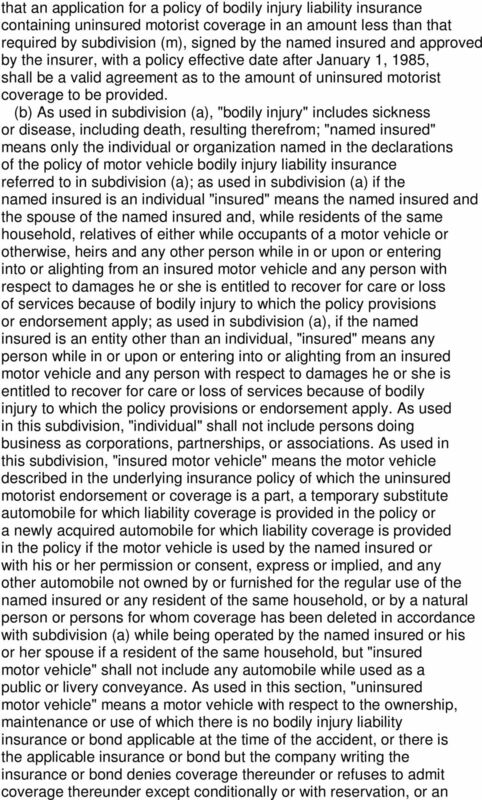 The insurer and any named insured, prior to or subsequent to the issuance or renewal of a policy, may, by agreement in writing, in the form specified in paragraph (2) or paragraph (3), (1) delete the provision covering damage caused by an uninsured motor vehicle completely, or (2) delete the coverage when a motor vehicle is operated by a natural person or persons designated by name, or (3) agree to provide the coverage in an amount less than that required by subdivision (m) but not less than the financial responsibility requirements specified in Section of the Vehicle Code. 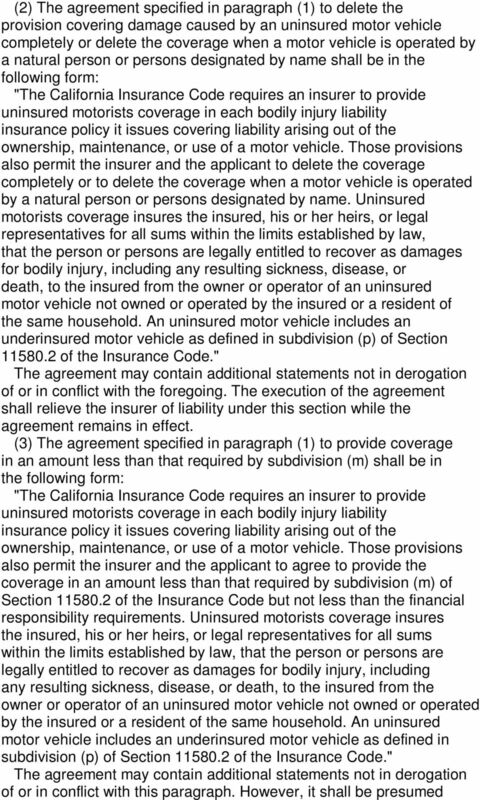 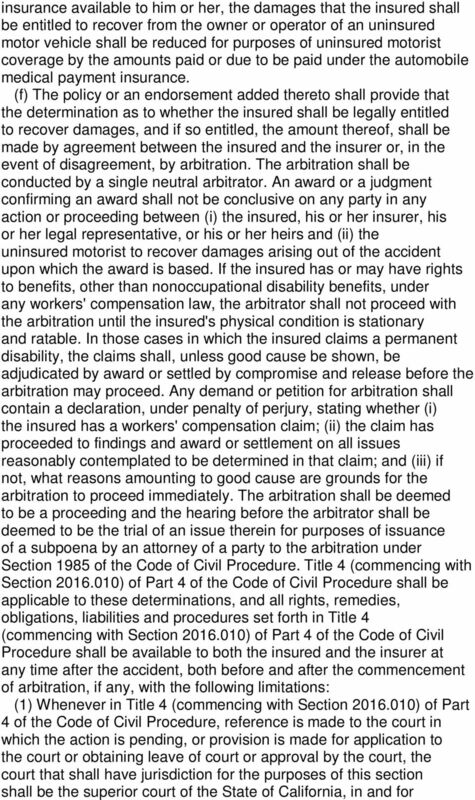 Any of these agreements by any named insured or agreement for the amount of coverage shall be binding upon every insured to whom the policy or endorsement provisions apply while the policy is in force, and shall continue to be so binding with respect to any continuation or renewal of the policy or with respect to any other policy that extends, changes, supersedes, or replaces the policy issued to the named insured by the same insurer, or with respect to reinstatement of the policy within 30 days of any lapse thereof. 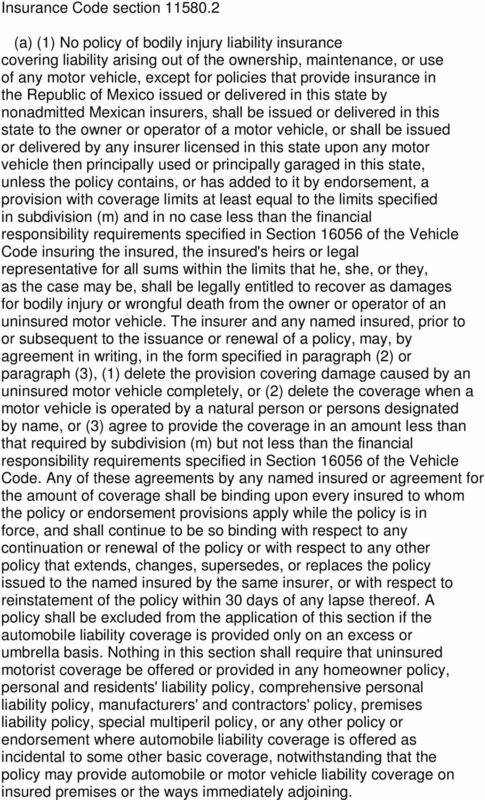 A policy shall be excluded from the application of this section if the automobile liability coverage is provided only on an excess or umbrella basis. 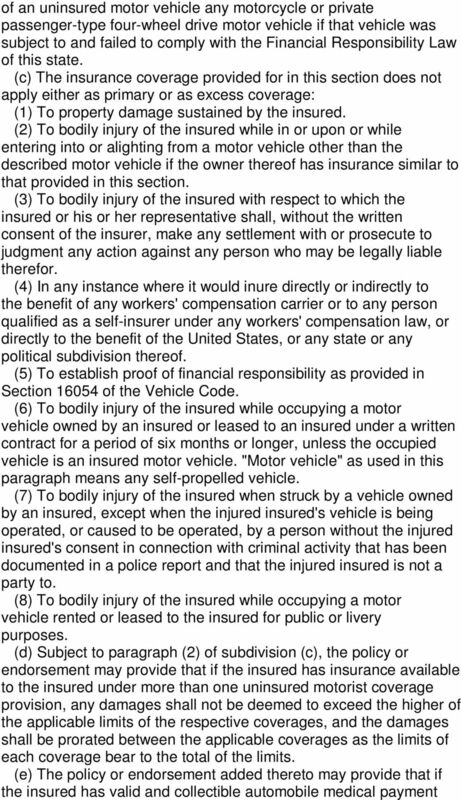 Nothing in this section shall require that uninsured motorist coverage be offered or provided in any homeowner policy, personal and residents' liability policy, comprehensive personal liability policy, manufacturers' and contractors' policy, premises liability policy, special multiperil policy, or any other policy or endorsement where automobile liability coverage is offered as incidental to some other basic coverage, notwithstanding that the policy may provide automobile or motor vehicle liability coverage on insured premises or the ways immediately adjoining. 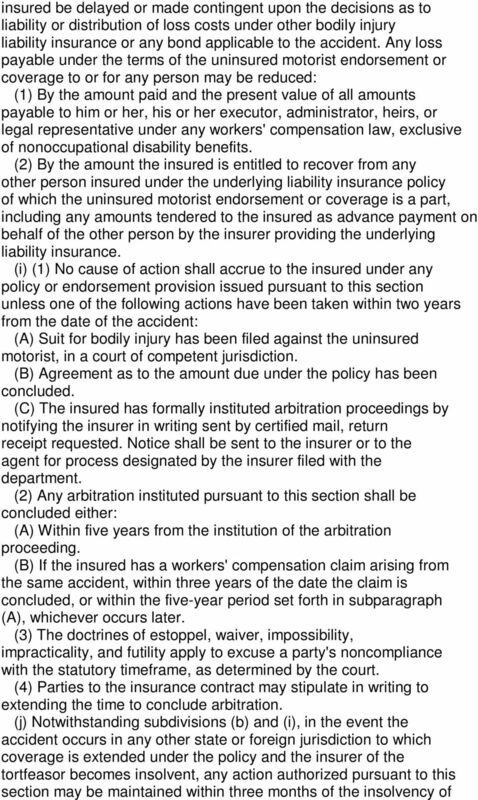 11 furnished the insurer, at the insurer's expense, within a reasonable time. 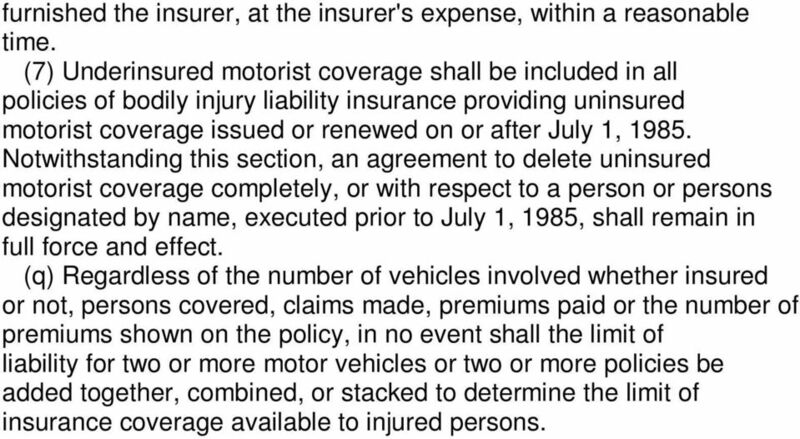 (7) Underinsured motorist coverage shall be included in all policies of bodily injury liability insurance providing uninsured motorist coverage issued or renewed on or after July 1, Notwithstanding this section, an agreement to delete uninsured motorist coverage completely, or with respect to a person or persons designated by name, executed prior to July 1, 1985, shall remain in full force and effect. 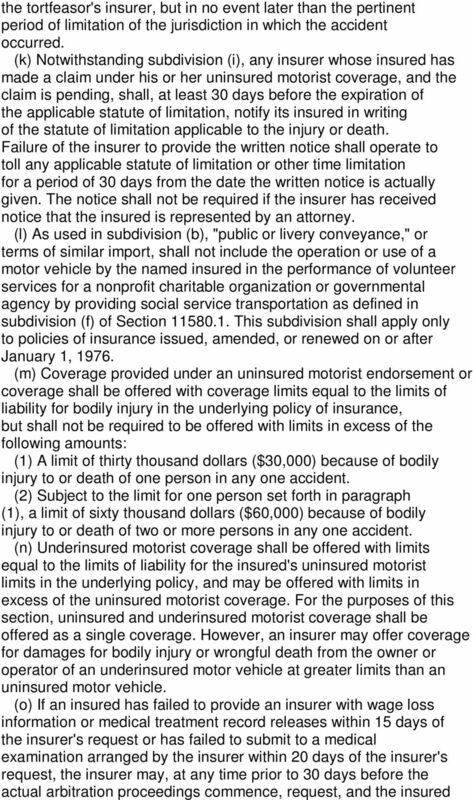 (q) Regardless of the number of vehicles involved whether insured or not, persons covered, claims made, premiums paid or the number of premiums shown on the policy, in no event shall the limit of liability for two or more motor vehicles or two or more policies be added together, combined, or stacked to determine the limit of insurance coverage available to injured persons. 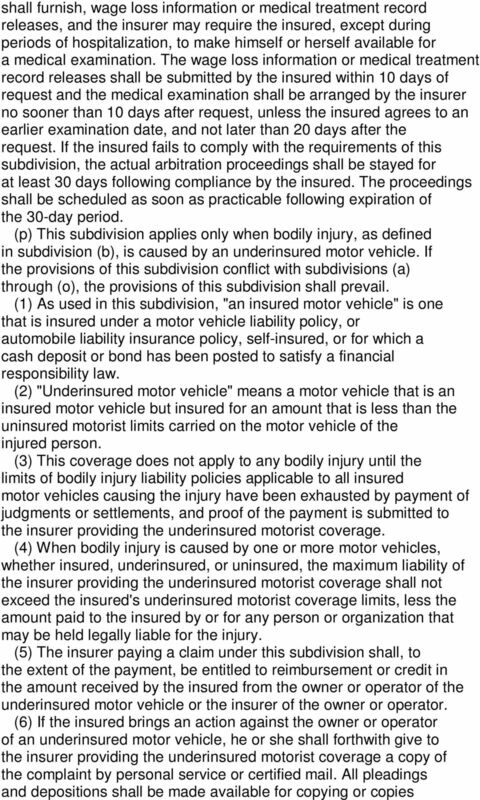 COMMERCIAL AUTOMOBILE INSURANCE POLICY ILLINOIS IMPORTANT Notify the Company at 4245 N. Knox Ave., Chicago, IL 60641, (773)299-7500, 7500, of EVERY accident, however slight, immediately upon its occurrence.